On February 5, 2011, the hugely distinguished Film Studies scholar Miriam Bratu Hansen passed away. The next day Film Studies For Free published its appreciation of her career with links to other online tributes to her, and to examples of her work online. It is still this website's single most visited entry, a tiny sign of warm esteem in which she was held in our discipline. Since the publication of her remarkable, final book Cinema and Experience, last year, three further, openly accessible items of great interest have appeared online. Two of these are part of a Dossier on Hansen put together at the Critical Inquiry website: the above video about Hansen, and a collection of five major articles that Hansen published in that great journal. All are accessible at this webpage. And you can also read the wonderful first chapter of Cinema and Experience -- on the work of Siegfried Krakauer -- at the University of California Press webpage. To further celebrate the above, FSFF has updated its links to useful online discussions or applications of Hansen's work, including, at the foot of this entry, a very recent video presentation. 'Paranoid Hermeneutics as Queer Cinematic Vernacular' by Catherine Grant. A film studies presentation prepared for the "Queer Cinema and the Politics of the Global" Workshop held at the University of Sussex, May 12, 2012. The Workshop was part of series of events held by the Arts and Humanities Research Council-funded research network GLOBAL QUEER CINEMA based at Sussex, led by Rosalind Galt. This event on March 30, 2012, was part of: Homage to Michelangelo Antonioni (1912-2007) held at the Casa Italiana Zerilli-Marimò, New York University, to mark the centenary year of the Italian director’s birth organized jointly by the Department of Italian Studies and the Department of Cinema Studies, NYU. Despite Antonioni’s deep concerns about scientific logic and any objective representation of reality, in purely formal terms his work is always defined by a clear tension between what I would call on the one hand a documentary impulse, and on the other a drive towards fiction pushed at times to the level of melodrama. Today, Film Studies For Free gleefully celebrates the publication online of just under seven hours of videoed content from an excellent, recent conference in New York City that its author had really wished she'd been able to attend. Now -- virtually -- she (and you) can! The conference took a timely new look at the work of FSFF's favourite Italian filmmaker Michelangelo Antonioni one hundred years on from the year of his birth. It followed on from the recent publication of an excellent, similarly inspired, BFI/Palgrave collection of work on Antonioni edited by Laura Rascaroli and John David Rhodes. Rhodes, a highly esteemed (and much loved!) colleague of FSFF's humble scribe, appears in the video frame still at the top of this post, and throughout both embedded videos. He was one of the organisers of, and main contributors to, the NYU conference. A very generous sample excerpt from his and Rascaroli's book may be found here. To accompany the truly excellent videos, FSFF has assembled a rather fabulous list of links to other online and openly accessible studies of Antonioni's work. If you know of any significant resources missing below, please leave a link in the comments. Grazie! If you happen to be in the vicinity of Antonioni's birthplace of Ferrara between September 30, 2012 and January 6, 2013, you'll be able to catch an excellent exhibition about his work, which opens following a public celebration of the filmmaker on the day of his birth itself (September 29). You can find more information here. Thanks to Antonioni scholar Ted Perry for his tip off about this event. Do look out for his new book on him which should be out next year. The concept of 'double outsideness' in the work of a displaced film-maker is articulated in essays on Sirk and Ophuls, while the essay 'An Avant-Garde for the 90s' usefully connects Willemen's early work in film studies to his later preoccupation with non-Euro-American cinema. Film Studies For Free was saddened by the crushing news of the death, just over a week ago, of Paul Willemen, the brilliant and hugely influential film theorist, critic, programmer, historian and, above all, activist. Willemen started work at the British Film Institute in the early 1970s, and was part of the editorial group of Screen in the second part of that decade. In 1976, he became involved with the journal Framework, which had been founded two years earlier by Donald Ranvaud, Sheila Whitaker, and others at Warwick University. He took over as its editor in 1982, handing over that role fully to Jim Pines between 1986 and 1989. Working as a BFI employee with film museums and cinemateques, he collaborated over many years with the Edinburgh Film Festival. In 1986, in that festival's 40th anniversary year, he, Pines and June Givanni organised a famous "Third Cinema" conference. 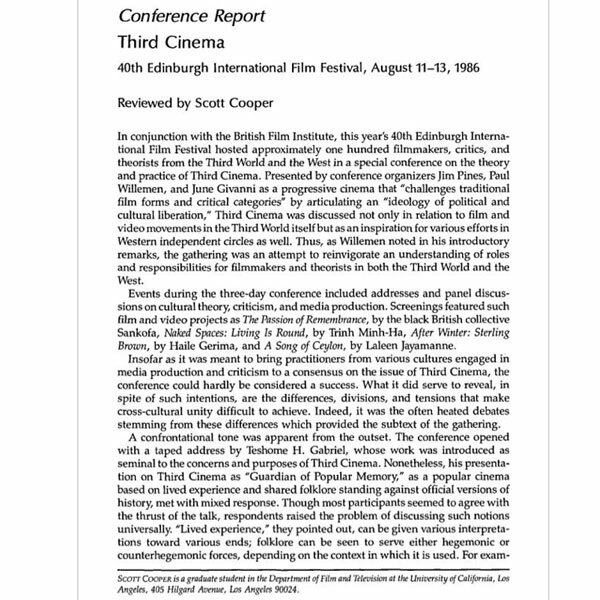 Questions of Third Cinema, the landmark volume that resulted from the conference, co-edited by Pines and Willemen, was in part a transcription of contributions that importantly explored the "cinema of diasporic subjects living and working in the metropolitan centres of London, Paris, New York" (p. vii) as well as elsewhere. As well as one of Framework's principal contributors over the years, he was also author and editor of many other important books, pamphlets, and articles on cinema. Some of these are pictured or named above, and more are listed, passim, below. Having dropped out of his Belgian university in 1960 ('And I never went back'), Willemen's first proper experience of working in a higher educational context was a three month trip in 1980 to Griffith University in Brisbane, Australia, where he participated in many groundbreaking seminars on cinema and film theory. In the late 1990s, he was Professor of Critical Studies at Napier University in Edinburgh, and from 1999 until his retirement in 2008 he was Research Professor of Media Studies at the University of Ulster. In memory of Paul Willemen and his contributions to Film Studies, Film Studies For Free is very honoured to present, below, some wonderful, fitting tributes to him and his work by four people who knew and worked with him over the years: Adrian Martin, Lesley Stern, Martin McLoone and Michael Chanan. Thanks very much to each of them for their words. Below their tributes are FSFF's customary links to online publications of Willemen's writing and to discussions of his work. It is appropriate on such occasions to wish that the person who has just died will rest in peace. After his struggles with illness in recent times, especially, FSFF certainly wishes that for Paul Willemen. But to honour his inspirational contribution to our field properly, those of us who work in his wake -- on cinephilia, on comparative film studies, on film and politics -- need more than ever to take up his passionate restlessness, even as it would impossible, or undesirable, to embrace every one of his personal stances or attitudes. He will always be in our memory. We will forever be in his debt. Paul Willemen is sometimes off-handedly regarded, by those who haven’t looked at his work terribly closely, as someone who was (and remained) part of a horde of ‘Screen theorists’ emerging in the 1970s, single-mindedly dedicated to enforcing the shotgun marriage of Lacan, Althusser, Barthes and Derrida within the then institutionally burgeoning field of cinema studies in the UK. In fact, Paul always followed a very singular path, and he was fiercely critical of many of the developments and tendencies around him. His distinctive contribution begins, in my opinion, with the early meditation (published in 1974) on the concept of inner speech in cinema, via the theories of Boris Eikhenbaum. 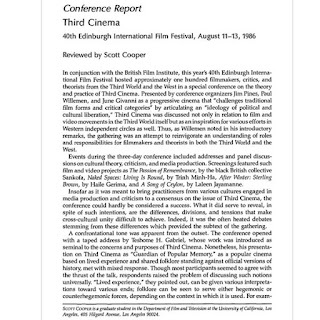 It was a concept he was to return to again and again, in key articles of 1981 (“Cinematic Discourse – The Problem of Inner Speech”) and 1995 (“Regimes of Subjectivity and Looking” [The UTS Review 1(2)). What was inner speech all about? Fundamentally, a doubling: images arise (in the mind, and on screen) with words attached, encoded in their veritable DNA; no image exists in some pure realm of visual expressivity or imagination, but rather is always-already enmeshed in what Paul would refer to ‘webs of meaning’, threads of social discourse. Beyond being a specific trope, I believe inner speech served as a sort of figure or metaphor for Paul, and for his way of thinking. Nothing (certainly no film text) was ever pristine for him, everything was produced in an intersection of forces, lines, influences and contexts; each person, each action, each object was the result of a ‘subject formation’ that needed to be grasped and explicated. But, as determining as such a subject-grid could be, it also – as in the always unstable interplay of images and inner speech – provided a space for interference, short-circuiting, and thus for internal modulation and change. Paul had little faith in the movement known as cultural studies as it emerged in the 1980s, and even less in its almost religious invocation of ‘popular resistance’; but he did believe in the hopeful force of desire (starting with the desire for cinema itself, cinephilia), and in its constant process of mobilisation – a mobilisation that had to occur not just in writing and teaching about film, but also in editing and publishing (his years at the helm of Framework, and with various BFI book and DVD projects), in the programming and presenting of work (the film culture of organisations and festivals), and in active, collaborative relations with real filmmakers (and Paul knew many, from Stephen Dwoskin to Amos Gitai). Over the last 15 years of his life, Paul sketched out, in various places, an ambitious program for a ‘comparative film studies’ of world cinema; these pieces need to be collected in a book now, because they constitute a theory – and a critical-pedagogical practice – that we sorely need. Paul was someone who (as the saying goes) didn’t suffer fools lightly, and he made a polemical show of denigrating most forms of sloppy, sentimental humanism; but his politics was of a truly passionate kind, and its core was summed up in the title of a film that he championed: So That You Can Live. Beguiled. I was beguiled by Willemen. The first film we ever discussed (or argued about) was Don Seigel’s The Beguiled, a baroque Freudian parable in which Clint Eastwood plays a Confederate soldier who has his leg cut off by a group of demented Southern women. It was 1975 and I had just scored a job as assistant publicity officer in the Regional Film Theatres Dept at the BFI. Soon after I arrived Paul Willemen came in as boss of the section. I knew who he was, had earnestly devoured the Edinburgh Film festival publications, and gobbled up all the film theory emerging at that time. I was enthralled by the distant figures who populated the stage: Peter Wollen and Laura Mulvey, Sam Rohdie, Stephen Heath, Claire Johnston and Paul Willemen among others. Willemen was the most mysterious and attractive to me: striding or lounging or soapboxing, in his leather jacket and boots he seemed to me a sort of European intellectual Marlon Brandon. At the BFI he ignored me. I mainly did filing, boring boring, but occasionally was allowed to write capsule reviews. Then one day, doing his job, he read my few words on The Beguiled and instigated an interrogation. It was terrifying. It was just a measly little paragraph but I had to defend it as though it really mattered, as though every word mattered. I had never been challenged about film like this. But it was also exhilarating. And I learnt a few things about Paul: for him the intellectual stakes were always high, no matter what the context, no matter who the interlocutor; he had a cinephiliac taste for the baroque and trashy; he had a droll sardonic sense of humour which was integral to his critical modus; for all his association with high theory he was also a pragmatist, clear-sighted about what working in cultural institutions was about. Within a few months I had moved to Australia, but over the years and across continents—meeting at conferences and festivals and bookshops—Paul and I became friends. We also fell pretty much out of contact in the last fifteen years or so. When I heard that he had died, an unexpected and terrible grief roared into the world. And a sense of loss. Of something lost from the world. Not just the person called Paul Willemen, but what he stood for. For many people. For someone with a not undeserved reputation for being cantankerous, aggressive, acrimonious, polemical, scornful, contemptuous he had a huge network of friends across the world. How come? And what would they all say? Very different things I imagine (many of his friends would probably not be inclined to talk to one another) so it is disingenuous to try and conjure into being a sense of PW through a few personal memories and encounters. But that is what I have, and how I can do it, and I hope that this question (of his irascibility combined with sociality) though submerged in what follows, will rise to the surface. Two scenarios, two extended exchanges: one taking place in the context of Framework, the other in BFI publishing. In the first half of the 1980s I was working on experimental Japanese cinema and spending time in Japan (living in Australia), and Paul was editing Framework. He cajoled me into writing up some of my material for the journal. This was at a time when I had left the academy and was very disenchanted with academic writing in general, screenese in particular; I also found the experience of being in Japan, of researching the various strands of experimentation from the sixties through to the contemporary scene, hyper stimulating but also culturally very difficult. I did not know how to write about it, how to find a language that was true to the history, that was informative for people who had no familiarity with these films and their cultural location, but that nevertheless somehow eschewed the anaemia of a disaffected third person voice. To some extent I saw Paul as the enemy here (a representative of screenese). But Paul liked to have enemies, and I liked the Framework project. Paul’s own account of the emergence and early history of the journal is on the Framework web site, but let me just say how significant the Framework intervention was and remains today, indeed how it is differentiated from much of today’s euphoric babble about the global, about world cinema. Although Framework was coherently dedicated to giving voice to, to researching, and unearthing voices, films, figures from outside the contemporary Euro-American mainstream it was remarkably eclectic and heterodox. Not only in the range of materials (interviews, archival documents, industry figures, theory, criticism, history, bibliographies, filmographies) but in modes of writing, modes of address. Throughout the years Paul was tenaciously committed to theorizing national cinemas and the concept of the national (instantiated in Theorizing National Cinema, the book he edited with Valentina Vitali) but he was also militantly opposed to institutionalized theory, to a professionalization of film studies which was totally ungrounded, lacking in historical research, untethered from political perspective and meaningful critical engagement. He practiced this precept in his own engagement in a variety of forums—film festival events and publications, involvement in various alternative cinema campaigns, writing encyclopaedias (on horror films for instance, and a monumental work on Indian cinema), collaborating on writing monographs and editing collections, and publishing. He was always curious about location, audience, address, and about how to write differently for different contexts and in order to make different kinds of interventions. So Paul patiently listened to me going on about Japan and the impossibility of writing about it. Interjected questions. Never patronized, never accused me of self-indulgence and preciousness. Simply assumed I would get it done. So I did. As editor he was dealing with lots of writers, not to mention filmmakers and others. From different places, different cultural formations. Making new friends, keeping up old feuds. And with all these balls in the air he had this fabulous capacity to give attention, to focus energy, to shape discursive threads and formulate a critique out of discontinuous and fragmented social entities. Some time after that, though the timeline is hazy for me now, Paul solicited and eventually rescued my Scorsese project from oblivion. He was a great editor, never dodging an argument, never imposing a point of view (even though we argued), but also never reluctant to cut my wordiness. I derived much pleasure from trying on occasion to outfox him by writing some sections that I knew he wouldn’t much like in such a way that he would find it impossible to cut. Sometimes it worked. I will be eternally grateful to Paul, first of all for suggesting Scorsese as a topic (for seeing something that I myself could not see), and secondly for publishing The Scorsese Connection. I cannot imagine where else I could have taken the project at that time. It did not adhere to any of the familiar protocols of academic publishing in Britain or the U.S. But his gesture is symptomatic more generally of his work as both a publisher and cultural activist, often forging pathways and opening up viewing and reading parameters, inflecting the conception of cultural production through frictional in-between spaces. Paul’s own book Looks and Frictions was part of the same “Perspectives” series. In her introduction Meaghan Morris suggests thinking of Willemen as “a thoroughly pragmatic utopian.” One aspect of that utopian pragmatism (to invert the terms) is manifested in the number of collaborators Willemen has had; the way his name is linked with other names on major books and projects for instance (Claire Johnston, Ashish Rajadhyaksha, Jim Pines, Valentina Vitali to name a few) suggests a pragmatic approach to cultural production as joint work, involving provisional alliances, and assumed intellectual and political negotiations. The utopian dimension was socialist, not always in easily recognizable terms, but always concerned with intervention and underpinned by the belief that all transformative aspirations need to be two-way, to arise out of knowledge and analysis. And then it came about that I fell out of contact with PW so I cannot speak of recent years. Eventually we had a very long and fierce and exhausting argument, as I remember it about affect and performance and cinephilia (his exchange with Noel King about cinephilia in Looks and Frictions, incidentally, is a pleasurable read and a truly collaborative intellectual working-through). In martialling his ammunition Paul showed me Ghatak’s Meghe Dhaka Tara (Cloud-CappedStar), which was a revelation. But we were each intransigent. We parted with affection on that occasion but somehow our exchange had run its course, and we never really connected again. Hearing of his death I felt overwhelming regret at losing touch. But then I remembered that Paul was the least sentimental of beings. I remembered being beguiled. I remembered many things about PW and his work that I do not want to forget. His dire dystopic warnings—just as much as the utopian pragmatism—seem pertinent today. It is timely to be reminded that the intellectual stakes should be high. Paul Willemen embraced academic life relatively late, arriving at the University of Ulster at Coleraine in 1999 after a short spell at Napier in Edinburgh. His reputation and standing within academic film studies was, of course, formidable by this stage. He had played a key role in the 1970s and 1980s in defining the subject area in the UK and helping to shape and mould both the subject’s theoretical terrain and its institutional structures. These earlier years were characterised by his dual commitment to promoting a ‘cinephiliac’ understanding of popular cinema – especially mainstream American cinema – and to promoting an understanding of alternative cinema in all its formal and political diversity. In his years at Ulster, he pursued two further theoretical obsessions – the concept of comparative film studies and the pleasures of and political contexts of the action film, especially in its heroic classical mode. He entertained a rapt audience at Ulster during his professorial lecture by showing some muscle-bound examples of the genre and offering a political and economic critique of the Italian peplum tradition. He was also vexed and intrigued by the concept of national cinema and his dissatisfaction with the ‘national’ was the spur to his interest in comparative film studies. Ulster provided him with an incongruous but strangely apt environment to pursue this interest. He was also very generous with his time. When my own study of Irish cinema was published in 2000, he attended a launch event in Dublin on the Monday evening and deposited a three-page critique of the book in my pigeonhole at Coleraine on the Friday morning. He pointed out the theoretical shortcomings of the book and spotted an ambiguity at its centre as well as offering a reasoned and wholly professional critique. He was, of course, spot on as usual and it was the measure of his erudition and insight that I was neither annoyed nor dismayed by his critique. He was right. And since I knew well that Paul did not suffer fools, as he saw them, gladly I was also flattered by the attention. This is what made him, despite his formidable intelligence and learning, popular with students as well. He took the time to take them seriously. Paul was not an institutional person and he always found the workings of bureaucracy draining and straining and in the end, I think he found the University system counter-intuitive to his conception of learning and thinking. He was, however, a good colleague and friend and when he retired in 2008 I certainly missed having his intellectual engagement around the place. I assumed that he would continue to write and teach in retirement, operating with the relative freedom of the independent scholar. It is extremely sad that his illness and early death has deprived us of one of the most accomplished and challenging intellects in our field. Sad to hear of the death of Paul Willemen. I didn't know him well; our relationship was that of professional colleagues. And I often disagreed with him. But he was a splendid intellectual interlocutor. I recall in particular a summer afternoon in Italy in the early 1980s where we coincided at the Pesaro film festival. Pesaro had come into its own in the late 60s as perhaps the most radical of Europe's film festivals, and among other things, a place to see new films from Latin America, of which there were several that year. Simply meeting there was a sign of certain shared values about film and politics. We wandered off between two screenings to eat ice cream and got stuck into an argument that I've never forgotten, about artistic languages, in which he fiercely defended a Lacanian position that I couldn't accept because I didn't think it worked for music. I came to the conclusion that Paul didn't have a musical ear, but also that I needed to try and grapple with Lacan (something I only did many years later). I have another indelible memory of Paul from the end of the 90s. I had run into problems at the college where I was then teaching. In those early years of New Labour, a new non-academic Dean had been appointed on the promise of bringing contacts with industry. She quickly proved a disaster who thought that academic committees were like the rubber-stamping variety she'd known at the BBC, whence she came. For various reasons too complicated to rake over, I was the poor sod who got scapegoated with a specious disciplinary charge that the institution was subsequently forced to withdraw on legal advice. But not before a large number of friends and colleagues had written emails to the Head of College in my support. The very first to write, in an exemplary demonstration of solidarity, was Paul, who, in a few elegant but trenchant lines, charged the college with infringement of academic freedom. His was a principled voice of a kind that we urgently need more of today, and I'm glad at least of the opportunity to pay tribute to him here. Film Studies For Free was so inspired by its discovery of the above video (with its wonderful sequences from Hara's films) that it concocted a short but high quality, accompanying list of links to some wonderful online resources about the Japanese documentarist's work, as well as related issues of Japanese cinema. Please note, especially, the excellent monograph on Hara by Jeffrey and Kenneth Ruoff (one of the wonderful books by the now sadly defunct publishers Flicks Books), which has been added to FSFF's permanent listing of openly accessible ebooks. 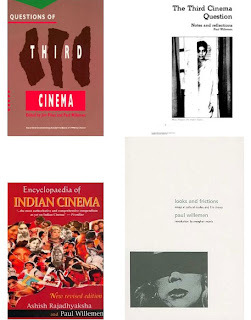 That book's co-author Jeffrey Ruoff has an incredibly generous collection of some of his other film studies work online here. And Aaron Gerow, one of the speakers in the above symposium has an amazing collection of his own online work, much of it on Japanese cinema here. A video essay by Christian Keathley on a canine moment in Strangers on a Train (Alfred Hitchcock, 1951). A videographic assemblage by Catherine Grant of all the edits in Rope (Hitchcock, 1948), together with adjacent dialogue. You can read more about Rope and about the context of this video here. Film Studies For Free proudly presents, above and below, its annual contribution in support of the wonderful "For the Love of Film: The Film Preservation Blogathon", May 13-18, 2012. Two video essays (above) -- one newly published online for this occasion by Christian Keathley, the other newly made for it by FSFF's author -- plus (below) links to/embeds of lots more, fascinating and openly accessible, audiovisual studies of Hitchcock's films. Please consider supporting this cause by making a donation-- however small or large -- at this link. Thank you! And a huge thanks, also, to Farran Nehme (read her great post on Farley Grainger who features in both of the new video essays), Marilyn Ferdinand and Rod Heath for devoting their marvellous websites and energies to assembling a team of well over one hundred bloggers from around the world to respond to this cause -- the third, great, year in a row. If you know of any further Alfred Hitchcock video essays of interest online, which aren't listed above or below, please leave a link in the comments. 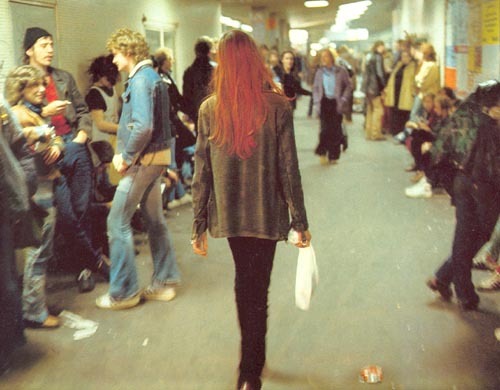 Framegrab from Christiane F. - Wir Kinder vom Bahnhof Zoo/Christiane F. – We Children from Bahnhof Zoo (Uli Edel, 1981). Read Varpu Rantala's essay on studying this film via the link given below. Full contents are set out below. Silent film based on 1873 novel of the same name by Charles J. Kickham. Production company: Film Company of Ireland. Director: Fred O'Donovan. Screenplay: Ellen Sullivan. Released in Ireland, the United States, and Britain in 1918. This film is in the public domain. Film Studies For Free happily tips its readers the wink that there's a new special issue up of the high quality open access film studies journal Screening the Past. Issue 33 is devoted to the study of one of Ireland's first feature films, Knocknagow, an incredibly popular historical drama set during the land-clearances of the 1840s. Six articles by specialists examine this cinematic landmark in relation to Irish history, politics, sport, literature, and cinema in Ireland and the United States. Appendices include a plot summary, contemporary press reviews and publicity materials, and a copy of the screenplay. The issue contains a link to the film itself (embedded above), which was shot on location in Tipperary in summer 1917. Screening the Past, Issue 33, 2012: "Featuring the Nation: Knocknagow (1918) and the Film Company of Ireland"
The Railway Children (Lionel Jeffries, 1970) was a film I ardently watched countless times on television as a child, and, I have to confess, I have seen and loved it countless times since. I had certainly seen it long before I saw L'Arrivée d'un Train en Gare de la Ciotat (Lumière Bros., 1895). I noticed the resemblance between the two films only when watching Jeffries' film again recently. But when I explored this, I was struck by the extent of their resonance, and by the uncanniness of the later film's pastiche of the earlier one: Bernard Cribbins' Perks revivifies, down to his moustache, the La Ciotat station porter; an identical luggage trolley lurks in the background; the beshawled woman looks like she stepped off the earlier train, except that she's in Technicolor. I began to figure, to fantasize, that the uncanniness of The Railway Children's penultimate sequence was not only set off by its graphic and musical evocation of the uncertainty of young Bobbie (Jenny Agutter) about quite why she was standing by the rail track, but also by its palpable haunting by the Lumière's originary scene, with its powerful, ghostly, urtext of a, much more bustling, railway platform just after the arrival of cinema. In the 'folklore’ of cinema history there is one anecdote which seems to be perennially fascinating to layman and historian alike. It might be summarised as follows: an audience in the early days of the cinema is seated in a hall when a film of an approaching train is projected on the screen. The spectators are anxious, fearful - some of them even panic and run. Above, Film Studies For Free gifts to you another of its author's experiments with real-time video comparison (also a further exploration of cinematic pastiche). This tiny videographic donation accompanies the links, below, to Omar Ahmed's truly wonderful, much more comprehensive and informative video essay series on trains in Indian cinema. And below those links are others to further, openly accessible online scholarship that touches on the topic of railways -- a very cinematic apparatus indeed -- in the movies. Greg Eamon, 'Farmers, Phantoms and Princes. The Canadian Pacific Railway and Filmmaking from 1899- 1919', Cinémas : revue d'études cinématographiques / Cinémas: Journal of Film Studies, vol. 6, n° 1, 1995, p. 11-32. A pluralist, pro bono, and purely positive web-archive of examples of, links to, and comment on, online, Open Access, film and audiovisual media studies resources of note. Founded in 2008, FSFF is lovingly tended (in a personal capacity) by Catherine Grant, Professor of Digital Media and Screen Studies at Birkbeck, University of London. She always wanted to be a Borgesian librarian when she grew up. End of July Round Up! Grusin and Kara on the post-cinematic, new ALPHAVILLE, WORLD PICTURE and ANIKI, Keathley, Bellour, Mittell, and Wasko videos, and lots more! Celebrating Ten Years of FILM STUDIES FOR FREE, with Two New Aretha-on-Film Tributes and Tens of Other Awesome Links! Film Studies For Free is dedicated to the Public Domain (except in the case of any featured or cited elements which are legally attributed to a rights owner or author other than Catherine Grant). JURN: search 2,500 arts & humanities ejournals.